Blue Pearl Granite is a Natural material. 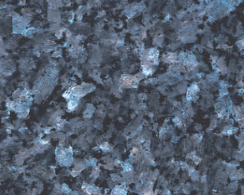 Blue Pearl Granite is a Low priced Granite stone. Blue Pearl is a stunning Blue/Grey granite. Its amazing pearlescent crystals give it a shimmering effect. Blue Pearl really stands out in a nice white kitchen with stainless steel appliances that really complement each other. Blue Pearl is one of the most attractive granite worktops available and is amazing when you first see it, but could you still see yourself looking at it in 20/30 years time? If yes, then this is a great purchase to make. Blue Pearl Granite is a Natural Granite from Norway, Landford Stone offer this type of stone in a variety of thicknesses and finishes. Blue Pearl Granite is a Low priced stone and will look incredible in your home!